The purpose of cellular respiration is to harvest high-energy ELECTRONS from glucose, with which to produce ATP Energy. This is accomplished by a 4-step process, which oxidizes the Carbons of glucose to Carbon Dioxide and Water. Anaerobic cells can use this method to produce a small amount of ATP energy. 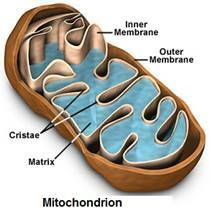 Mitochondria (Cells'“Power Plants”) are large organelles with double membranes. The outer membrane is smooth, while the inner membrane has long folds called cristae. The word “Glycolysis” means to break down sugar: glyco = sugar, and lysis = to break. 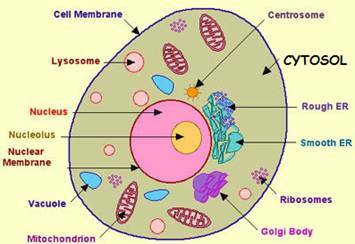 Glycolysis occurs in the cytoplasm of eukaryote cells. Glycolysis has 8 steps each catalyzed by a specific enzyme which nets 2 ATP molecules and 2 NADH from each molecule of glucose broken down. After glycolysis, the pyruvate molecules enter step 2. Pyruvate is shuttled into the mitochondrion where it is decarboxylated (a carbon group is removed as carbon dioxide) - and the now 2-carbon compound is attached to Co-enzyme A(CoA, a derivative of vitamin B5) forming a molecule called Acetyl CoA, stripping off another 2 electrons, which are carried by NADH. Insufficient Oxygen produces Lactic Acid - Pyruvate is turned into lactic acid instead of forming Acetyl-CoA. Inefficient Fat Metabolism causes Brain fogging - ß-oxidation of fats supplies the best source of Acetyl-CoA, however the brain can only generate Acetyl CoA from glucose, not from fat. Aging causes fat metabolism inefficiency, causing us to burn and use up glucose instead of fat (glucose that would otherwise have been available for the brain), to form Acetyl CoA. This explains why older people complain of brain fatigue. Acetyl CoA only lasts 2 hours in the system. Amino acids can also be converted to Acetyl CoA for entry into the Kreb's Cycle. Changes Acetyl CoA into Energy -Electrons are removed from Acetyl CoA forming carbon dioxide. This cycle occurs twice per glucose molecule. The Citric Acid Cycle has 8 steps each mediated by a specific enzyme. As each acetyl CoA goes around the cycle 2 carbon dioxide molecules are given off, 3 NADH, 1 FADH2, and 1 ATP. Net energy gain from Krebs per molecule of glucose is 2 ATP. The goal is to create a strong potential difference across the mitochondrial membrane, which can be used to create ATPenergy - Specialized proteins and enzymes located on the inner mitochondrial membrane form a molecular “wire”(an electron transport chain). By a process called oxidative phosphorylation (the coupling of oxidation with the addition of a phosphate molecule), NADH & FADH2 donate their electrons via this “wire”(through a series of intermediate compounds)to molecular oxygen, which becomes reduced to water, producing ATP. Chemiosmosis - Hydrogen ions (protons) are used to maintain an Electrochemical Gradient that turns the electron energy into ATP. Involves pumping protons across mitochondrial membranes to establish proton gradient, which passes protons down the gradient via the enzyme ATP synthase, whereby the energy of the protons is used to generate ATP. – At the last stage of the respiratory chain these hydrogen ions flow back across the inner mitochondrial membrane through ion-channels - where they drive a molecular enzyme “motor”called ATP synthase in the creation of ATP from adenosine diphosphate (ADP) and phosphoric acid (ADP is phosphorylated into ATP), somewhat like water drives a water wheel. 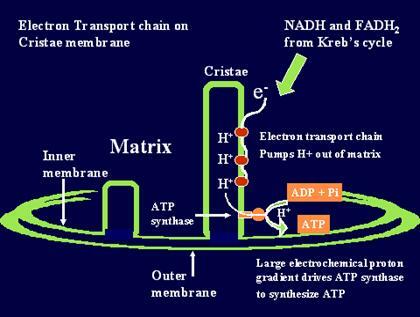 The energy released from ATP through hydrolysis (a chemical reaction with water) can then be used for biological work.